As Halloween draws ever closer, the time has arrived to discuss the annual “Fall Classic”, better known as the World Series of baseball. This year’s series will bring together two of the most historically prestigious Major League Baseball teams, who have both won multiple championships in the last decade. Bringing experience and top quality to the big matchup, this could be a World Series for the ages! The St. Louis Cardinals and the Boston Red Sox finished the season tied for the best record with a 97-65 mark. For the Cardinals, such a result was basically expected. They have been one of the most exciting teams in baseball over the last few seasons. In the 2011 World Series, the Cardinals won an incredible Game 6 in which they were facing final pitches on several occasions, but always managed to deliver. They would win the Series in Game 7. Last season, in the final NLDS Game 5, the Cardinals were down 6-0 before a stunning rally to win the game in the 9th inning. They progressed to the NLCS where they were beaten by the San Francisco Giants, but the Cardinals have proven that they can be toughest team to close out. Heroes like David Freese, Carlos Beltran, Matt Holliday, Allen Craig, and Matt Carpenter repeatedly make the plays to save the day! But the Boston Red Sox also have a marvelous history of comebacks. Who could ever forget their 2004 ALCS against the New York Yankees when they overcame a 3-0 deficit to beat their heated rivals in 7 games? They would go on to sweep St. Louis in the World Series, winning their first title since 1918, back when Babe Ruth was still a pitcher. The Red Sox would then win another championship in 2007. And although we are several years removed from those heroics, several current players took part in that 2007 season; Clay Buchholz, John Lester, David Ortiz, Dustin Pedroia, and Jacoby Ellsbury. The Red Sox may have had their disappointments in the last several years, missing the playoffs, dealing with aging veterans, and even having scandals regarding their pitchers drinking beer in the dugout during days off, but this season has seen a team rekindle the passion and desire so often associated with the Red Sox. Big Papi is swinging strongly again and the beards are back on full display! While both teams have had marvelous years, they have both been challenged since day 1 within their divisions. The Cincinnati Reds and the surprising Pittsburgh Pirates made life challenging for the Cardinals, and the Baltimore Orioles, Tampa Bay Rays, and even the lowly Yankees pushed the Red Sox to the brink. Nevertheless, both these clubs persevered through their challenges and rose to the top, fully earning their success with gritty wins and pulling through in clutch moments. So how can a humble writer go about predicting the winner of this series? The only thing I feel I can accurately call is that this could be the most entertaining and evenly matched World Series in years. These teams are basically carbon copies of one another. Both teams have great hitters that can put away home runs, and both teams have some excellent arms capable of dominating lineups. Both teams have ravenous fan bases, fully capable of carrying their teams to unprecedented heights. Both teams are fully loaded with championship-winning heroes. This is quite clearly the most fully deserving teams in baseball to find themselves competing for a championship. The World Series could be won on the rare error or stolen base. Who will blink first? I expect this series to go the full 7 games, but that the Boston Red Sox will win it all because they have home-field advantage. That’s the only difference I can see in these teams! This will be an exciting World Series as the Cardinals will be going for revenge! No matter which team wins, we will have the first collectibles commemorating the winning team. Our collectibles will show some of the highlights of the series, the series MVP, celebrations, and more. These great collectibles will be officially licensed by the MLB. Visit us at www.AAASportsMemorabilia.com to check them out! 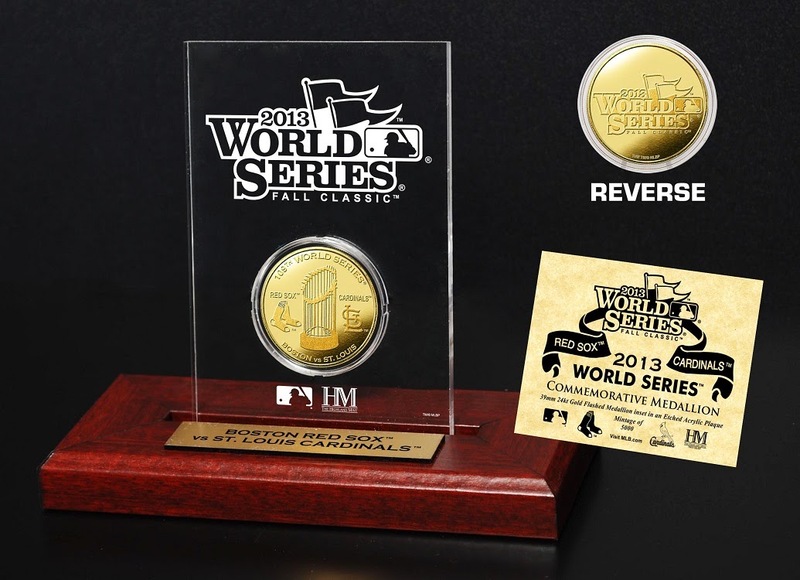 For those fans whose team did not make it to the World Series, we have collectibles for your team also!